Someone who owns a custom Corvette already has the perfect car, but that does not mean they have everything. 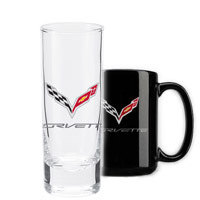 Gifts for Vette enthusiasts range from functional to decorative, and are guaranteed to make a big impression on birthdays, Fathers' and Mothers' Days, retirement parties, holidays or any other occasion that calls for a gift. Whether inexpensive tokens or valuable remembrances, Corvette branded gift items are always appreciated, and they let the recipient know that the giver cared enough to research their interests and preferences. A wide variety of C7 Vette logo items are available to suit any need. The classic small gift item may well be an insulated mug suitable for holding morning coffee. Corvette Mods carries appropriate mugs in several sizes, materials and colors. Tote bags and wearing apparel make suitable gifts for many occasions. Our selection comes in sizes and colors to suit any taste. Sophisticated Corvette owners may appreciate bar ware that carries the logo. To round out the selection, we also carry a lapel pin in the form of a Corvette logo that is sure to delight any aficionado. If none of these C7 Corvette gifts seems suitable, be sure to check our other pages, since many small items for the car itself make great gifts. 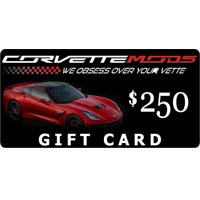 The most convenient way to purchase gifts for Vette lovers is to do it right here. Corvette Mods offers a ton of gift items carrying the Corvette logo, some specifically for the 2104+ C7 Corvette. If there is some doubt about an appropriate selection, our staff of Corvette lovers will be glad to make suggestions about appropriate gifts for anyone on any occasion.